This new DVD should have marked the return of Rolando Villazón and Anna Netrebko to the Salzburg Festival following on from their acclaimed La traviata together, which was also filmed by Deutsche Grammophon, and they have more recently been seen on DVD in Massenet's Manon, filmed in Berlin last year. But the soprano's pregnancy led her to withdraw from this Salzburg production of Roméo et Juliette. 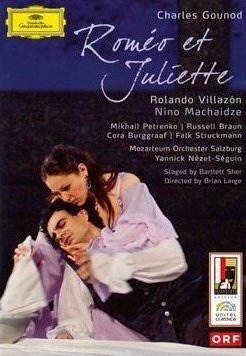 She was replaced as Juliette for the performance captured on this film by Nino Machaidze, a young Georgian soprano who has something of Netrebko's Eastern European edge in her voice but has less of her glamour and charisma. There are many impressive aspects to Machaidze's apparatus, it's true: she sings with fearlessness in the technically-demanding 'Je veux vivre', reacts emotively to what's going on around her onstage, and rises to the occasion in the opera's dark closing scene. Yet the same level of artistry just isn't there. Nor is there the connection between Machaidze and Villazón that the Mexican tenor usually seems to have with Netrebko. He and Machaidze clearly like working together, but the instinctive ease of the Villazón-Netrebko partnerships is sorely missed in this, an opera which is structured round its extended, intense love duets. Admittedly, matters aren't helped by the location of the performance. Apart from a couple of Mozart opere serie, I'm not sure I've ever seen an opera DVD filmed at the Salzburg Felsenreitschule that has been totally successful. The voices don't tend to be very well picked up, and the orchestral sound is somehow subdued and homogenised, which is particularly noticeable in this most luxuriously-orchestrated of operas. Yannick Nezet-Seguin conducts with maturity and gusto, but he doesn't seem to be able to obtain the range of colour that the opera demands if it's to engage from start to finish. Then, too, it surprised me how drab and uninspired Bartlett Sher's staging is. To be frank there's not much to get excited by in this Roméo, and even the Personenregie is dull in places, not least in the final scene; here's where Netrebko's innate theatricality is missed. By sticking with the historic arcades of the Felsenreitschule as the primary backdrop, Sher and his designer (Michael Yeargan) make us all too conscious of the performance space, rather than transporting us to the tense world of the Capulets and the Montagues. Sher's strength is in handling the action scenes well, always making the swordfights and crowd scuffles appear totally spontaneous and tense. This helps to evoke the teenage angst of the story, which is to blame for most of the violence and death in the plot. Sher also controls the contrasts between public feuds and private passions quite well, but I still feel that the venue works against the intimacy needed for this opera (which had not previously been staged at the Salzburg Festival). Overall, the production is efficient but lacks any distinctive qualities or memorable interpretative gestures. There are some excellent performances, however. Villazón knows how to turn up the drama several volts and even if there occasional hints of strain, the passion he brings to moments such as the murder of Tybalt at the end of Act 3 raises the quality of the film. Cora Burggraaf is exceptional as Stéphano – bright of tone, spunky in character – and Falk Struckmann seems like luxury casting as Capulet, a short role in which he makes a typically great impact thanks to his vocal gravitas. Mikhail Petrenko also makes a strong impression as Frère Laurent, while Russell Braun's Mercutio and Robert Murray's Benvolio are perfectly fine. In general, though, I feel that Gounod's achievement in Roméo et Juliette – especially the Wagnerian influence of Tristan on the extended love duets – could be much more compellingly performed and staged than it is here.